Living in Ireland puts Hannah Wayte in a good position to test a popular stereotype – do the Irish really drink that much? If an Irishman tells you that he can come up with at least 50 synonyms for ‘drunk’ off the top of his head, do not mistake this for empty bluff. Unless, of course, you are quite happy to listen to him rattle off a list of some of the oddest vocabulary you have heard for the next five minutes: from ‘locked,’ ‘flutered,’ ‘banjoed,’ and ‘trousered,’ to ‘tanked,’ ‘stocious,’ ‘baloobas,’ ‘jarred,’ ‘langered,’ ‘snookered,’ ‘ossified,’ and ‘rubbered.’ And that’s not including turns of phrase like ‘three sheets to the wind’ or ‘in the horrors’. According to a recent report by the World Health Organisation, while Ireland doesn’t house the heaviest drinkers in Europe – that honour goes to Central-Eastern and Eastern Europe – the drinking patterns here appear to be more damaging, with over half of all Irish drinkers being more inclined to binge drinking. Clearly, Irish drinking vocabulary is as colourful and varied as Maltese expletives. Ireland is renowned for two things above all else: greenery and alcohol. There’s no refuting the first – the country suffers enough rain to earn the title of Emerald Isle. As for the second, however, there’s no denying that Ireland is famed for its drink. But are the Irish really as much a nation of drunks as popular belief would have you think? I’ll come right out and say it – not really. Guinness, Baileys and Jameson are all iconic Irish brands and you’ll be lucky if you can escape a holiday without coming away with at least a trip to the Storehouse or a branded t-shirt under your belt. Their logos are so commonly spotted all over town that you’d be forgiven if you thought the Irish substituted water for the stuff. Tourism relies heavily on these products, which draw visitors in from all corners of the globe every year. Unfortunately, they are also the main reasons the country as a whole is equated with a drinking culture. In Ireland, there is a pub on most corners no matter where you find yourself. Moreover, it’s a matter of course for most people to wander into one on a Friday evening after work, or even on a school night if you’re feeling adventurous. “Go on, just the one,” is all it takes to persuade any stragglers. Popping into a pub is even customary for visiting dignitaries – US presidents Reagan, Clinton and Obama all stopped for a pint, although the Queen couldn’t be convinced to take a sip of the black stuff on her recent visit. Yet the thing about Irish pubs is that the aim of the game is not necessarily to go there and get drunk – rather, they are fantastic places where you can sit down, relax and socialise. In those terms, there is certainly a prevalent drinking culture in Ireland. In spots favoured by the locals there is usually no music playing, purposely to encourage conversation. I have spent hours with friends in a pub and walked out sober on many an occasion. In this way bars here differ to other countries, certainly to Malta, where the main point of going to a bar is to drink. That said, my answer to whether the Irish really drink that much wasn’t a straightforward ‘no’ for a reason. When they decide they want to drink, they most certainly know how. That’s a wide generalisation of course, but I’ve met my fair share of Irish who can drink me under the table (and have). 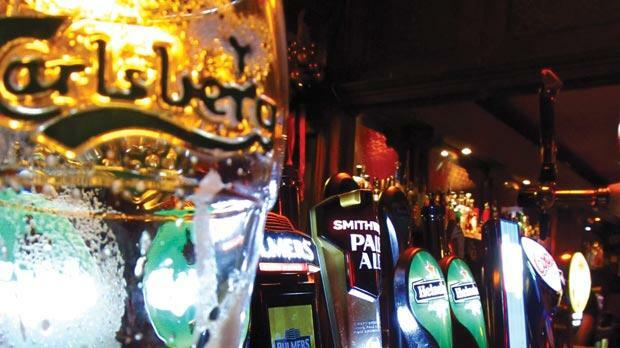 According to a recent report by the World Health Organisation, while Ireland doesn’t house the heaviest drinkers in Europe – that honour goes to Central-Eastern and Eastern Europe – the drinking patterns here appear to be more damaging, with over half of all Irish drinkers being more inclined to binge drinking. Taking a walk through Temple Bar on a Saturday night is all you need to get a glimpse of this side of the story: teenagers passed out on doorsteps, rowdy drunks getting kicked out of bars, the odd person vomiting into the gutter... sound familiar? That would be because Temple Bar is Dublin’s equivalent to Paceville. It’s also one of the most touristy spots in the city, which would explain why so many visitors go home with their own tales of the bleary-eyed Irish. However, this particular picture isn’t an average weekend for everybody. Even if we wanted to end up that mangled on a weekly basis, most of us couldn’t afford it, given that a simple gin and tonic can cost anything upwards of €6. The exorbitant price of alcohol is the main reason a lot of drinking, if it is to be done, is driven indoors – most nights out start off as a bring-your-own-bottle party at someone’s house. Also, bars and pubs close relatively early in Ireland – between midnight and 1 a.m., or up till 3 a.m. if it’s a late-night bar. The fun begins after they close, just as long as you can get an invitation to a house party or find one to crash. I was smart enough to move to Ireland after the recession hit but I am reassured that binge drinking was far more of a problem in the days of the Celtic Tiger. Nowadays, there is a much bigger focus on dry nights, which are events that don’t involve alcohol. There are also far more coffee shops opening around town. That said, I did take the opportunity to join an alcohol-free comedy night but, truth be told, the jokes just weren’t as funny without a pint in hand. The drinking culture in Ireland is undeniable but the idea of it is far worse than the reality. The image of redheads drinking pints of Guinness in pubs every night of the week will continue to be propagated to bring the tourists in, but to be honest, they’re the ones who do most of the drinking.